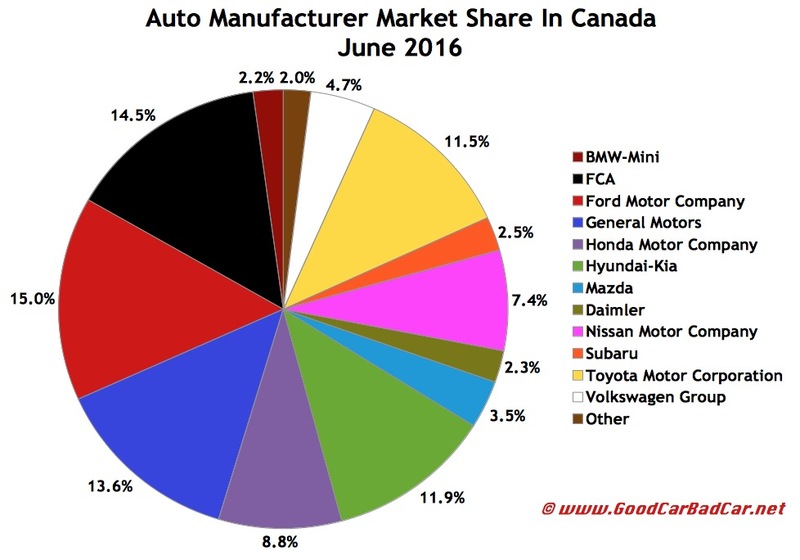 Not bothered in the slightest by a brief downturn in May 2016, the Canadian auto industry rebounded with a 7% surge to more than 191,000 sales in June 2016, the best June in the history of the Canadian auto market. Through the first five months of 2016, Canadian auto sales gew 6%, a massive rate of expansion in a market which soared to all-time record highs in calendar year 2015.The rate of growth slowed slightly in May, however, in part because a quirk in the calendar, in part because the decline in passenger car volume eroded with special rapidity. June 2016, however, turned out to be a revealing month for the industry, as auto sales shot beyond 190,000 units, a figure crested only once in all of 2015, for a third consecutive month. The Ford Motor Company, not the year-to-date leader FCA, was Canada’s top-selling automobile manufacturer in June 2016. Outselling FCA by 923 units thanks mainly to strong F-Series volume, Ford MoCo shrunk FCA’s halfway-point lead to 2597 sales. Fiat Chrysler Automobiles’ two namesake brands, meanwhile, both lost half their June sales in the sixth month of 2016, but total FCA Canada volume increased 2% because of strength at Jeep and Dodge. General Motors Canada produced across the board June 2016 sales gains, with improvements coming from all four brands: Buick, Cadillac, Chevrolet, and GMC. For Nissan, June was yet another month of above-average growth. Infiniti rose 5%, but the Nissan brand’s 13% growth came largely on passenger car strength. It was the best month ever for Nissan Canada and the Nissan brand. Honda Canada’s namesake Honda brand rose 4% on the strength of Civic, HR-V, Odyssey and Pilot, but the Acura brand was down 12%. At Porsche, June results tied July 2015’s 730 sales for the second-best month in Porsche’s history. Toyota Canada’s 6% increase occurred as the Toyota RAV4 set an all-time monthly sales record with 5021 units. Hyundai Canada produced a massive 41% year-over-year uptick thanks to the Tucson’s best month ever (4044 sales) and the Santa Fe XL’s best June ever, plus a big gain from the Elantra, too. Mercedes-Benz was Canada’s top-selling premium auto brand in June. Ford Motor Company’s own Ford brand led all individual marques; the Ford F-Series was Canada’s best-selling pickup truck and top-selling vehicle line overall. The Honda Civic led the car category; Toyota’s RAV4 was tops among SUVs/crossovers. No auto brands posted worse year-over-year declines in June than Fiat Chrysler Automobiles’ Fiat and Chrysler brands, save for FCA’s ultra-low-volume Alfa Romeo outlet. Smart, Volkswagen, Acura, and Mini all reported double-digit percentage declines. On the other end of the equation, blessed with a hugely appealing new SUV, Jaguar climbed 191% to 405 units. Hyundai’s 41% uptick was tops among volume brands, but 14 other auto brands posted double-digit percentage gains. Year-to-date, Fiat and Chrysler’s 64% and 30% losses, respectively, are clearly the worst. Soon to be discontinued, Scion’s 78% leap forward is best. 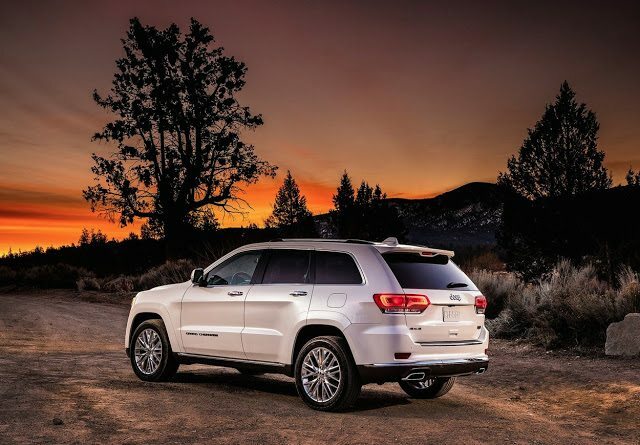 Among volume brands, Jeep’s 20% improvement stands above the rest. Thanks to Global Automakers Of Canada, we can also now include Maserati figures straightway at the beginning of the month. The U.S. equivalent of this page can be viewed here. Don’t like to see automakers arranged alphabetically? 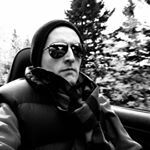 Click column headers to sort automakers by June sales, year-over-year change, year-to-date totals, or any other order. Best seller lists for cars, trucks, and SUVs will be added in the next few hours. In the coming days, GCBC will also publish a complete list of year-to-date sales for every single vehicle line, a list which includes brand results. To find out what you can expect, you can see the 2015 year end version of that post here. You can always find historical monthly and yearly sales figures for any brand by clicking the brand name in the table below or by selecting a make (or model) at GCBC’s Sales Stats page. ^ Excluding Sprinter: up 3.0% to 3781 in June; up 5.5% to 20,549 YTD.